“We dream of offering natural building, carpentry, and metal working skills to communities that donâ€™t have easy access to them. 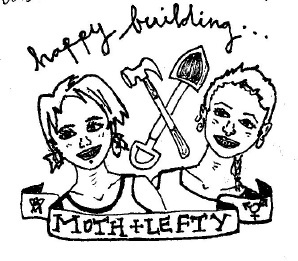 We know that acknowledging social discrepancies and working to support the needs that arise from peoplesâ€™ from unique backgrounds is essential to spreading this information as well as creating positive learning environments.This cob-oven pamphlet was made for a workshop we taught to fabulous young trans-gendered people and ladies at a â€œskill-shareâ€ in Mt. Hood in the summer of 2011. We wanted to make natural building literature that reflected our community as a way to address a new audience that is not regularly appealed to. We want young people to recognize that these techniques can belong to them as much as anyone. While weâ€™re excited about building with any enthusiastic, respectful people, we especially hope to share what weâ€™re learning with youth, queers, ladies, communities of color, and poor folks. We hope you like this booklet, that you go out and build an oven, and that you will support the free sharing of great ideas!